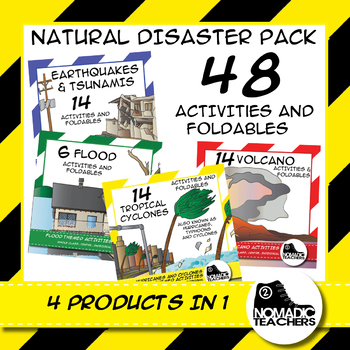 This activity pack contains 4 products in one with a total of 48 activities and foldables. In the preview file you can see the samples of each product with full list of activities and photos of some of the activities included. 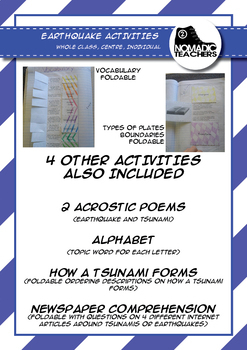 This activity pack contains 48 activities to explore the topics listed above. They can be used as whole class activities, centre activities or individual activities. The activities strongly combine the science topic with reading skills and strategies. Many activities relate to the comprehension strategy of summarising. Some are also writing prompts. Some of them link to internet sites for technology use. 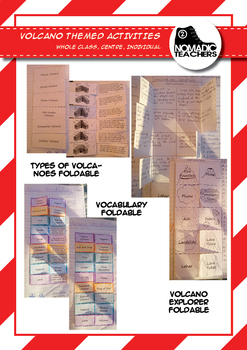 A lot of the activities are in foldable format. Answers are included where appropriate. 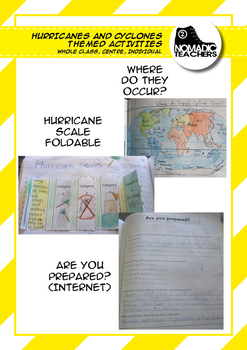 The only resources that are needed are some texts or books on natural disasters which can include websites. Any activities that require a text or book can then be scaffolded to the appropriate level.